One of my most favourite trips: Eildon-Jamieson or EJ as it’s now often known. The usual preflight checks complete and I set off nice and early from home for the ~60 odd minute “commute” to Yarra Glen. A rather idyllic commute as I take the Christmas Hills and Kangaroo Ground bypass (aka Pigeon Bank Lane etc) route. I come across Cliffy on his way too and he makes a most effective radar cover, just in case! No, seriously, it’s rather nice to watch how he takes corners with smooth lines and near constant momentum. Arriving nice and early at the “non sugar” fuel station, smiling faces greet Cliffy and I as we cram bug juice into our missiles. Just up the road and the meet point is looking crowded and we’re still about 15 minutes away from a launch. After the group pre-flight checks are complete (read: briefing) we’ve donned our kit and are almost ready to depart when a friendly cager yells out from across the street that Vic’s Finest are pulling up bikes just up the road on our intended flight path. A hasty conversation ensues between leader and compatriots and we take an alternate route: initially a round trip of the more untrodden parts of Yarra Glen then onto the route proper bypassing the offending area. What ride report would be complete without an assessment of the weather and the road surface conditions? Indeed. Most important stuff. Cool, cloudy and with the chance of rain. A big band of rain though is ominously moving east to south east on the radar. EJ could be right in the thick of it. Meh. I’m reminded of Ben’s catch cry a few weeks previously as we kit up on a trip down to Gippy “Time to get wet!”. Indeed. It could be again. The chance of a cleansing shower or three doesn’t put off the crew as we’ve got a good turnout. More on surface conditions as we progress. Heading up in the direction of Healesville we take familiar roads to Chum, which is in surprisingly good condition and remarkably untouched by the controllers who try to constantly arrest our velocity by reducing the maximum permissible flight speed. A well-spaced flock of bikes and by now as a group we’ve settled into a pace with the “faster” riders taking the lead and the “less” rapid opening up some navigating room. I do love riding through forest. Especially on cloudy days. The cloud enables an excellent view of the runway surface conditions without harsh shards of sunlight spearing through the trees dappling and obscuring road debris. Oh, I quickly gain on a fellow traveller decelerating into and around a corner. He’s pulling over, damn that’s early for issues to develop. Looks OK though, nothing mechanical. I later find there’s been some movement of his rear seat cowl. Up Chum, down Myers and through Healesville onto threatening territory. The Black Spur is such a short but great bit of road. The initial corners are some of my most favourite. Shame they’re so few in number but such a great surface. A good place to scrub in fresh rubber (I’m loving the Bridgestone S20Rs!) and I’m constantly reminded of the need to pay close attention to my speedo as I near the “straight” replete with its far too short dotted line. As I descend, I cheekily wave my hand in greeting to the watchers in the forest only to find that yes, they were there, as comfortably slipstreaming a 4WD, I espy a blue uniformed maintainer of the peace having just pulled in one of our crew. Bugger. They got someone. Doesn’t everyone know they sit under a camo net on that straight and radio ahead to their denizens? Apparently not. Unperturbed I encounter a log jam of boat trailers up the road and decide to play it safe on overtaking until I’m reasonably certain that we’re safe from harassment. Trees blur as we pull away from the roadhouse and onto the sweepers heading into Marysville where I pay a visit to the newly rebuilt sweet shop – a tax I pay to my (far) better half whenever I’m in the area. Laden down with food of the gods I strike up a conversation with the proprietors remarking about the Ever Vigilant on the Black Spur. It goes something like this: “How many injuries do you think that’s avoided?” I retort: “None at all”. They’re bemused. I explain. They listen. I’m surprised that they’re actually listening. I thought Newspeak had taken such a steely grip that they’d be immune to my arguments. Noting that I rarely venture here during the peak season, I feel that perhaps their loss of commerce could be a persuader. Maybe. Time to go. Heading past the golf course, which I must have ridden past for two years before noticing it (concentrating on the grey ribbon ahead of me) – and further ahead I round a corner to see a Jabberwocky dressed as a dark tinted 4WD parked parallel and close to the edge of the road. Not today! I ensure I’m at the permissible cruise speed (and I must have surprised that bloke right behind me with a rapid adjustment in altitude) and trundle onwards to the flatlands heading into Eildon. I see the sign. I hear the road. I feel my heart beating. I put my game face on. It’s EJ time! Surprisingly I’m close to the front on the pack, perhaps two or three in front of me then our leader for today. This will be good. I fleetingly wonder how long I’ll have them in sight? Nothing behind me. This will be fun. I assume the attack position, feet up, perched on the balls of my feet, thighs pressed against the tank, leaning forward, trying not to laugh maniacally. Concentrate. Flow. Become one with my machine. Make it an extension of me, of my thoughts, of my being. Flying through the forest I remember how much I love this road. The surface is good to excellent, some tree debris, a smattering of light gravel on some of the hairier corners…but what’s that? Behind me I feel the presence of other bikes. I steal a very quick glance and note that it’s probably Misho’s yellow CBR. Yep, that makes sense. I’m not holding him or them up yet so I own my sector of the road, comfortable in the knowledge that Misho and I have talked a lot about this. I refocus on the task. Flying on air, defying gravity, working with the physics of riding a sportsbike. Soon I’m passed and they take off around the corners, incredible how adept they are. The “new” section of EJ starts and surprisingly I shortly find myself behind our leader. Should I pass him? Could I pass him? I think he can feel me behind him, the pace quickens. I’m in heaven. Three years after the first metalling of this section and the surface has finally settled down. It tears at my tyres but it’s mostly secure now, seldom the sound of barrages of stones pelting my bike’s most intimate parts. I love how the entire section has a dotted line even around hairpins, maybe the makers were economising on paint? It’s a great ride. Rounding the final sweeping corner towards the brewery I accelerate to attack speed; crossing the bridge I note that Misho and crew have had sufficient time to unburden themselves of gloves and lids, light smokes as necessary, and man the corner – apparently one is convening with nature. 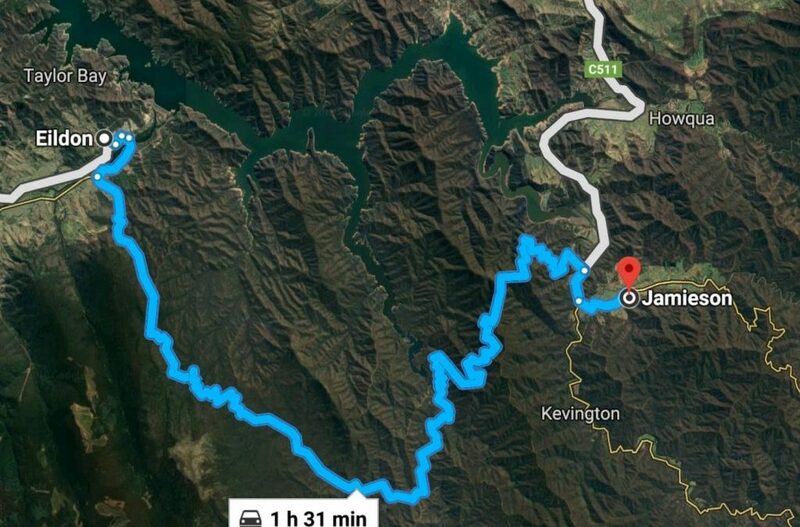 I mark the final corner into the Jamieson township and for shits and giggles start my lap timer, smoke a cigarette, eat two muesli bars, sip half a litre of water and clean my visor. An undisclosed duration later and the rear rider comes through. I’m still feeling like I’m on fire. Adrenaline must still be pumping through me. It’s a good thing that we take breaks even after such a relatively short distance. A brief respite swapping stories and we’re off again to repeat EJ, this time heading back through Skyline, Alex, through Whanregarwen, and finally Yea and Kinglake. It’s been an awesome day’s riding. I always look forward to riding and despite being spent when I get home, I can think back now to the day’s ride and still smile. Until the next one!